Bob Evans joined the Division of Cultural Affairs team at the end of August. Originally from Coxsackie, New York, Bob studied bassoon performance and music education at the University of South Carolina. He came to Florida State University in 2011 to pursue a Master’s degree in Arts Administration. As the Division intern through the spring, Bob will have the opportunity to participate in many of our different programs. He has already been working with Poetry Out Loud, the Florida Artists Hall of Fame, and some of our grant programs. I recently spoke with Bob about his background in the arts and the importance of the arts for the state of Florida. Bob Evans with his bassoon. Photo submitted and used by permission of Bob Evans. DCA: What are some of the earliest arts experiences you can remember? Bob: I don’t remember many specific arts experiences in my childhood. I feel like they were so ingrained into everyday life for me that maybe I just took them for granted. My father is a painter who idolizes Dalí, so I recall many of his prints in our house, and everyone in my family sings well, even if it’s just with the radio. In terms of a significant arts experience, I don’t recall anything sticking out until I was about 14. 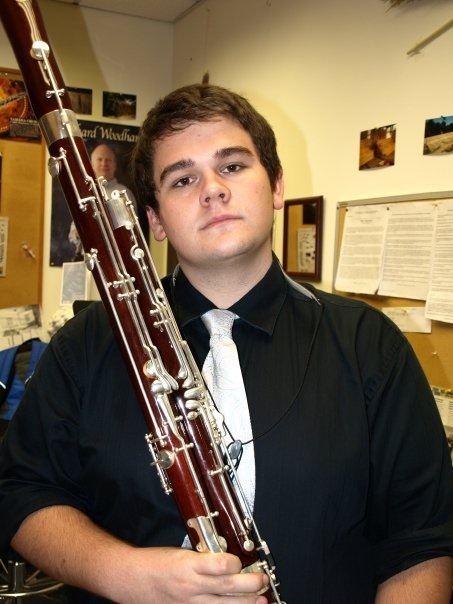 I’d been playing bassoon for a year and made it into a local youth orchestra. I was pretty nervous before that first rehearsal because I had never played in an ensemble with strings before, so I wasn’t sure what it would be like. We started with Ravel’s orchestration of Mussorgsky’s “Great Gate of Kiev” from Pictures at an Exhibition. I knew in that moment that I’d never be the same. That feeling of frisson when I heard those opening bars was what propelled me into a musical career. Of course, it was immediately dampened by my inability to read tenor clef and my complete lack of technical facility, but, thankfully, positive reinforcement trumps negative reinforcement. DCA: You’re actively pursuing a degree in Arts Administration. What made you decide on a career in the arts? Bob: Why does anyone decide on a career in the arts? The arts are important. They’re a basic human need essential for survival just as much as food, water, and shelter. Look at the creation of visual art and music in concentration camps during the Holocaust where, while fighting for their lives, people still produced powerful, meaningful art. I often think about that whenever I feel like I’m losing focus. DCA: The Division of Cultural Affairs believes in the motto “Culture Builds Florida.” What do you think when you hear that phrase? Why do you believe arts and culture are important to our state? Bob: I love hearing Culture Builds Florida! I wish we could adopt a “Culture Builds America” slogan. Imagine THAT on some bumper stickers! Culture Builds Florida says so much about what the arts can mean for a willing society. I know that in Florida, so much revenue comes from the arts: a single dollar’s investment can mean a return of 5 dollars! It’s amazing, but the trick is getting people to realize it. That’s another reason that I chose this career path. The arts mean business, not just here in Florida, but around the nation. I want to work to make sure that’s the case for a long time. This entry was posted in Art Talk and tagged arts administration, culture builds florida, florida division of cultural affairs, florida state university college of music by culturebuildsflorida. Bookmark the permalink. It’s been years since I’ve heard “The Great Gate of Kiev”. Thanks for the reminder. When Leonard Cohen said that “music lives in the chambers of our hearts” I wonder if he was thinking about Mussorgsky.